We’d love your help. 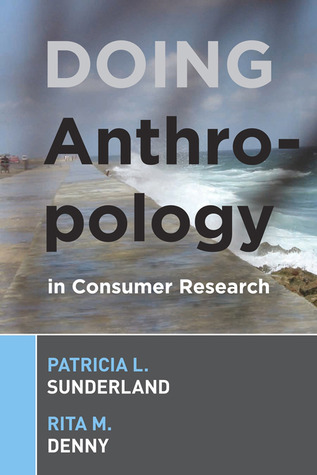 Let us know what’s wrong with this preview of Doing Anthropology in Consumer Research by Patricia L. Sunderland. To ask other readers questions about Doing Anthropology in Consumer Research, please sign up. I read this for Designing for Culture and Internationalization at Middlebury Institute of International Studies. Interesting case studies of applied anthropology, but not particularly helpful for someone who wants to know how to apply anthropological methods to learning about users/customers but isn't in a position to hire an anthropologist consultant. A good guide to conducting ethnography or "doing anthropology" in consumer research that is critical of sub-standard techniques but justifiably so. Just a warning that you may feel "told off" if you've previously mistakenly called research techniques "ethnography" that wasn't, such as simply videoing some people. Not great as a reference book but can flip through it for ideas and inspiration. She's a linguist so is from that perspective which makes it somewhat limited. Whoo, made it through this class. Not much to say about this book except that it helped a great deal for my Consumer Insight marketing class. Required reading for consumer anthropologists! Helpful. Especially the first chapter.